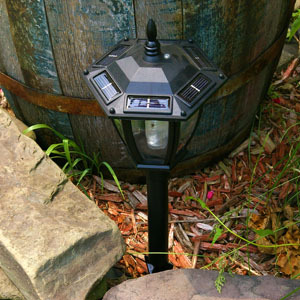 Ground Stake Solar Lights such as these are an elegant way to illuminate pathways, walkways, driveways, decks and patios. These Lights are easy to install easy to operate and require little, or no, maintenance over their lifetime. Simply attach the light fixture itself to the ground stake (if necessary) and then stake the ground stake solar garden light into the ground wherever in your landscape you prefer, and allow the light to charge in the sun. Then, once the sun goes down, the lights will be ready to illuminate. That is all you have to do. You will not even have to worry about turning these lights on or off. When the sun sets, the lights automatically turn ON, and they automatically turn OFF when the sun comes back up. If you decide you would like to relocate your Ground Stake Solar Powered Lights to a different area of your landscape, doing so is as easy as removing the light from the previous position and staking it into the ground in the new location. Feel free to move these lights anywhere where they receive enough light during the day to charge for a full night of operation. These ground stake solar garden lights are not only easy to install and operate; they are also durable, since they are made from heavy-duty, high-density poly-resin plastic. These lights can also save you a good deal of money when it comes to your electric your electric bills, since you will no longer need to depend as heavily on electric lights. Interested in learning more? Check out our Ground Stake Solar Garden Lights here.